In the beginning of this year a decision regarding the trademark right to the name of the iconic Danish faience set with the thin blue line on the edges, was issued by the Danish Maritime and Commercial Court (Decision no. BS.9705/2017-SHR of 18 January 2019). Both the designer of the faience set as pictured here, Grethe Meyer, and the manufacturer and distributor of the faience set, the Danish porcelain company Royal Copenhagen (owned by the Finnish company Fiskars), claimed to be the rightful owners of the trademark rights to the name under which the faience set had been marketed, namely BLÅKANT (which translates into BLUE LINE). The court ruled in favor of Fiskars who had manufactured and marketed the faience set using this name over a period of 50 years. The BLUE LINE faience set was created in the beginning of the 1960s by the designer Grethe Meyer and was marketed for the first time in 1965. 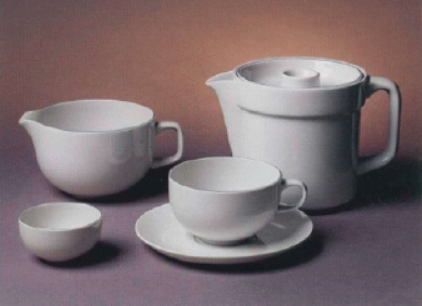 The set was manufactured by a company, which later became Royal Copenhagen, with whom the designer Grethe Meyer had entered into license agreements with in 1963 and 2004 respectively. In the license agreements it was specified that the copyright to the design of the set would remain with the licensor (the designer Grethe Meyer), but that Royal Copenhagen had the exclusive right to the manufacture and sale of faience set. The BLUE LINE faience set was marketed by Royal Copenhagen (and later Fiskars) from 1965 to 2015. When Grethe Meyer passed away in 2008 the rights to the design were transferred to her heirs according to the license agreement. When the daughter of Grethe Meyer passed away in 2016 she left a will in which it was stated that her niece was to inherit “all rights to my late mother’s designs, including royalties thereto”. When Fiskars in 2015 applied for the trademark BLÅKANT (BLUE LINE), the Danish Patent and Trademark Office refused to register the name because it was considered descriptive since the mark merely indicated that the goods in question, for instance plates, vases etc., were decorated with a blue line. However Fiskars were subsequently able to prove that the name BLÅKANT had acquired distinctive character through use since it had been used extensively for a long period as a trademark originating from the company. When BLÅKANT was registered on the basis of acquired distinctiveness, the daughter of Grethe Meyer opposed the registration of the mark on the ground that Grethe Meyer and her subsequent heirs were the rightful owners of the trademark BLÅKANT. In December 2017 the company Grethe Meyer Design initiated legal procedings against Fiskars. The opposition pending at the Danish Patent and trademark office was suspended on the basis of the court proceedings. In support of Grethe Meyer and her heirs it was argued that Grethe Meyer was the inventor of the name and that there was a natural close connection between the faience set and the name, and that the design rights related to the faience set could not be separated from the name, which it had been marked under for 50 years, namely BLÅKANT. As Grethe Meyer had come up with name and since the name was used in relation to her design, it was argued that Royal Copenhagen had used the name on behalf of Grethe Meyer who was therefore the rightful owner of both the design rights and the trademark rights. Fiskars on the other hand argued that when the original license agreement was made, no trademark right existed since the name BLÅKANT was merely a description of the faience set and therefore such right could not be considered part of the license agreement. The trademark BLÅKANT had been established only be means of use by Royal Copenhagen through a period of 50 years and therefore the trademark right belonged to this company who had invested many resources in the marketing of the product. Fiskars also argued that only the design rights and the copyrights (and not the name or any trademark rights) had been passed to the heirs of Grethe Meyer. The court ruled that first of all the wording of the will which mentioned “all rights to Grethe Meyer’s designs” did not necessarily refer only to design rights and copyrights, but could also include any potential trademark rights. However the agreements between the parties only focused on the design rights and the payments of royalties and did not mention the right to the name or any trademark rights. The court therefore went on the conclude that it had not been proved that the designer Grethe Meyer had preserved the right to the name or acquired any trademark rights to this. Consequently the court ruled in favor of Fiskars who were entitled to keep the trademark registration of BLÅKANT in Denmark.